It always tickles me when I happen across something I didn't even realize existed. It's like so many of us feel completely "dialed in" to the comics industry via the internet, that nothing really excites or surprises us anymore. Then, from the corner of your eye... you see the textbook-sized DC Comics: 1993 The Year of Change Editorial Presentation... on a shelf with a $2.00 price tag on it. Now, tell me... who could say no to that (besides, of course, the dozens of folks who had already passed it by)? So, just what is this thing anyway? 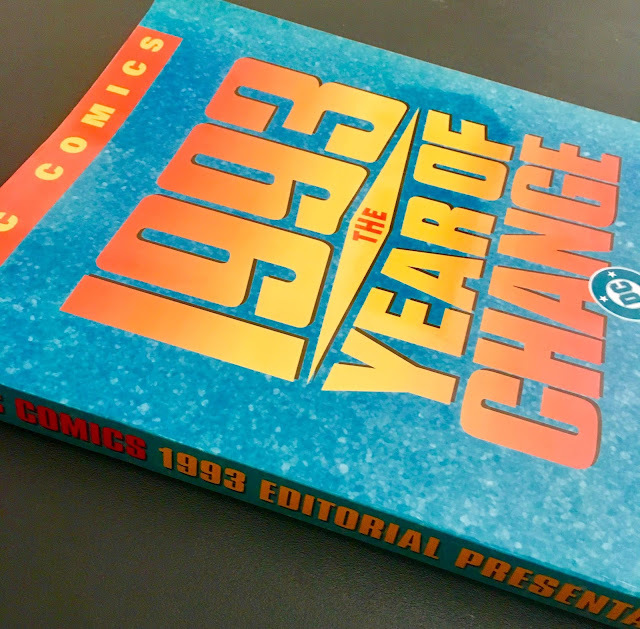 Well, it's part Previews Catalog, part State the Union Address... and if you care to join me, together we can take a deeper look into this odd little time capsule from the "boom era" of DC Comics. 1993 saw the birth of the multi-cultural imprint known as Milestone. 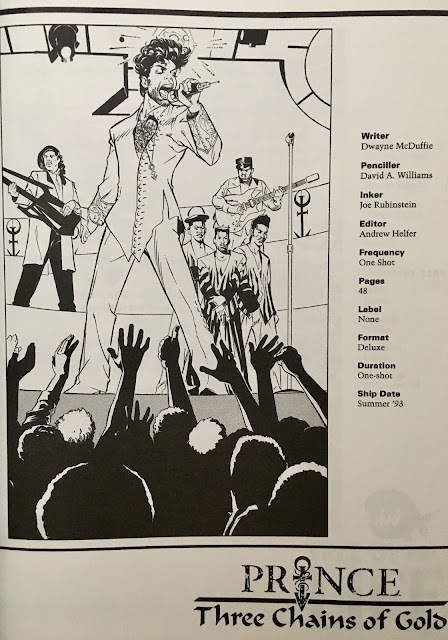 With the mission statement of presenting "exciting heroes in a context of urban reality", we are introduced to the imprint's four titles: Icon, Blood Syndicate, Hardware and of course, Static. 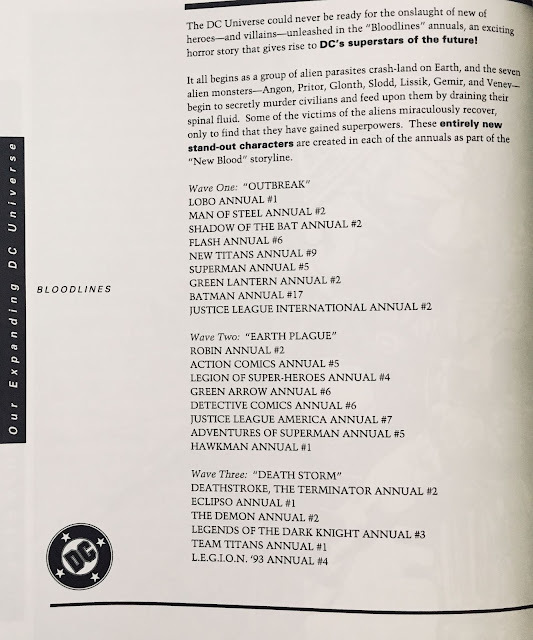 For those unaware, these titles take place in the city of Dakota... sometimes referred to as the "Dakotaverse", much later as an actual city in the DC Universe proper (pre-Flashpoint). During a gang war between three rival gangs, the secret police use a radioactive "tear gas", which leaves many of the survivors "altered". An imprint near and dear to my heart, Mark Nevelow's Piranha Press was DC Comics' first attempt at a true "Mature Readers" line of alternative comics. It was also the first imprint from DC Comics to allow creator-owned material. This imprint would run from 1989 until 1994 when it would morph into the more "boutique" brand, Paradox Press. 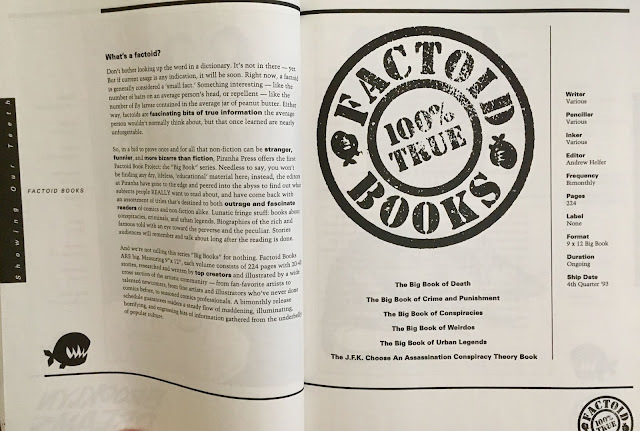 The big news out of Piranha in 1993 was the launch of its Factoid Book Project... otherwise known as the "Big Book" Series. 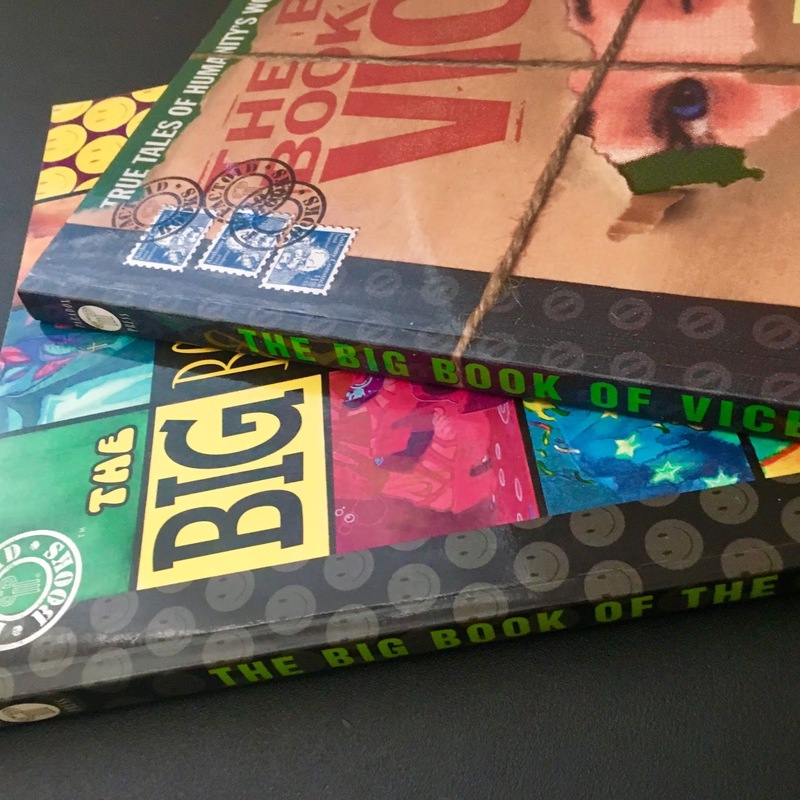 The "Big Book" line would actually never hit shelves under the Piranha Press banner... DC would hold off on the release until the Paradox shift was complete. Worth noting that this very book does announce what would be, the final (though we didn't know that yet) Piranha Press offering... Prince: Three Chains of Gold. 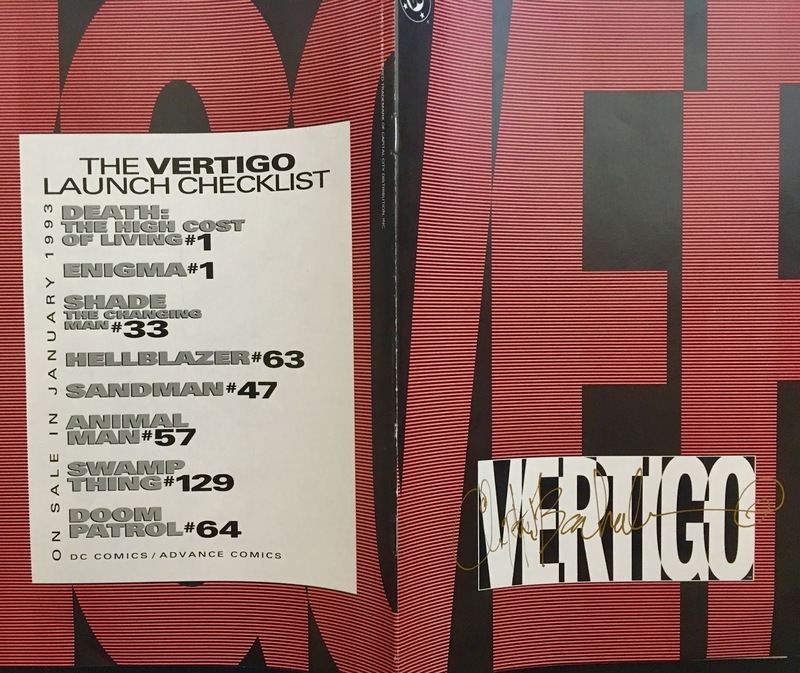 1993 also saw the official launch of DC Comics' Vertigo Imprint! 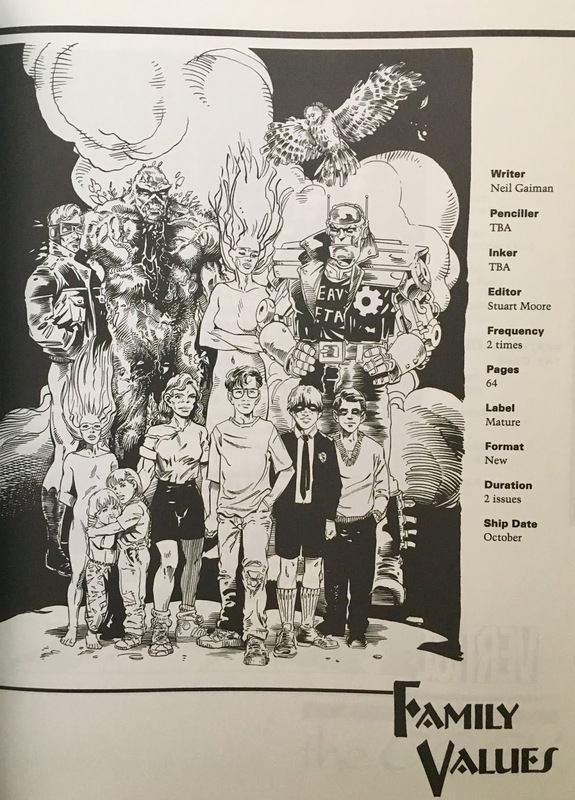 Bearing a Mature Readers warning... and playing with DC Comics-owned characters (as well as creator-owned work), the writing was very likely on the wall for Mark Nevelow and the gang. Ongoing DC titles marked with a January, 1993 cover date... including Animal Man, Doom Patrol, Shade the Changing Man, Swamp Thing, Sandman, and Hellblazer were shifted over to the nebulous new imprint to continue their current volumes. Seeing as though this was the early 1990's, Vertigo even went as far as to announce its first semi-line wide crossover event! We know it as "The Children's Crusade", however, here it's pitched as "Family Values". After two years of using Annuals for crossovers (Armageddon 2001 in 1991, and Eclipso: The Darkness Within in 1992), DC sought to make 1993 the biggest one yet with... Bloodlines. Interestingly enough... all of the issues announced would come out just as they were announced in this very book! It's shocking to see such forward-planning and commitment from any given comic book company. These days it feels as though DC (and Marvel) check the way the wind's blowing before committing to an order at the drive-thru! One of the biggest events of 1993 for DC (and comics in general) was the "Breaking of the Bat" in Knightfall. While this book refers to the storyline as Knightfall, it does not elaborate much. What we do get is the announcement that something big would be coming in Batman #500... a new costume (designed by Joe Quesada)... and the most shocking change in Batman's 50-plus year history. Speaking of playing their cards close to the vest... "Supermen" is the watchword for the Superman family of titles. But, get this... the retailers (who would likely be the only ones getting this book) received the same information as the readers... which is to say, not a whole lot! All four of the new "Supermen" are introduced, via outlines... without nary a hint as to whether or not any of them are the Real Steel Deal! This could not happen today. 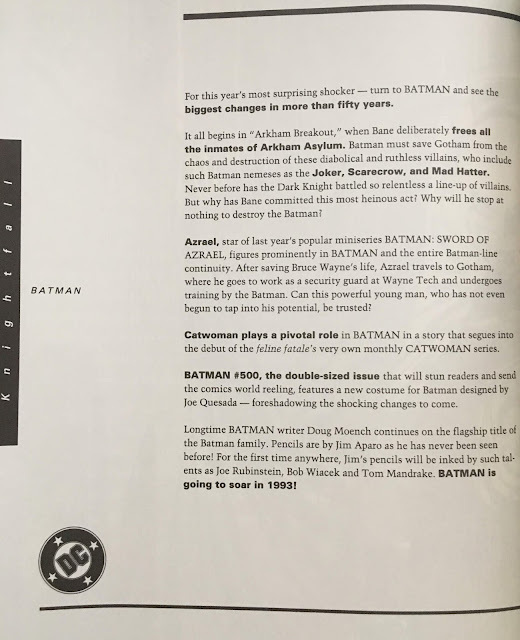 Flipping through this time capsule really affords us the opportunity to see, at a glance, where DC Comics' priorities were. 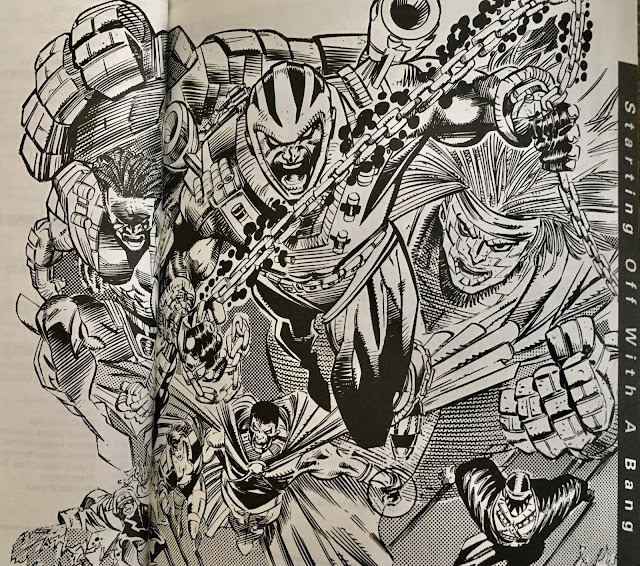 For a little fun let's take a look at the Top Three characters when it comes to who had the most "paginal real estate" in this very book. To close out, this was a ton of fun to flip through... and lemme tell ya folks, we've only scratched the surface! There's a lot of weird stuff we didn't look at (I mean, there are 18 pages on Lobo alone!). If you enjoyed this piece, please let us know... and we can share a bit more of this massive tome with you. 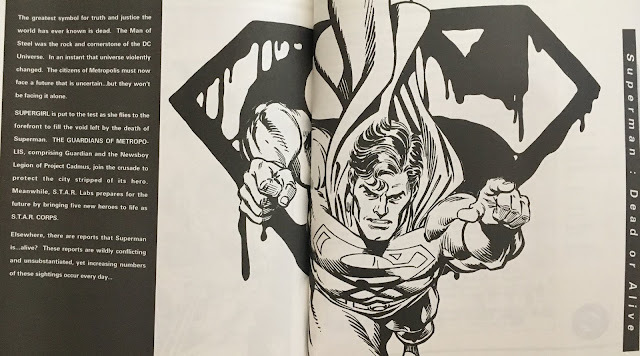 Chris Sheehan writes the very terrific Chris Is On Infinite Earths blog, and was one of the first contributors for DC in the 80s. When he's not writing about the BEST ERA OF DC COMICS ever, you can find him co-hosting the Cosmic Treadmill and Weird Comics History podcasts with Reggie Reggie. Man, I don't think you could find thing for a better year than 1993! So much transition and change happening. Do you know if Ragman: cry of the dead appeared in this book? Yep, it sure did! Got a two-page spread... I'll make sure to include it when it comes time to do a follow-up to this piece!